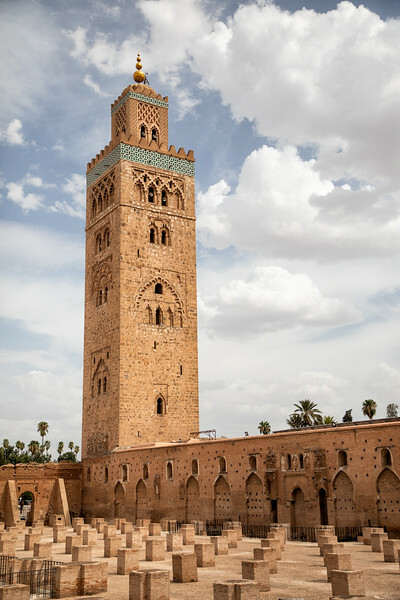 The Koutoubia Mosque or Kutubiyya Mosque is the largest mosque in Marrakesh, Morocco. The first mosque constructed here was completed in 1157, but halfway through construction it was discovered that the mihrab (prayer niche) was off-center and not oriented toward Mecca. The decision was made to build a new mosque next to the first structure, which was identical except for its orientation. While the first mosque’s mihrab was 5 degrees out of alignment with direction of Mecca, the orientation in the second mosque turned out to be 10 degrees, so further away from Mecca than the first mosque. The second mosque was completed by the 1190s and the first mosque eventually deteriorated. The mosque is located in the southwestern district of the medina and stands at a height of 253 feet.